#InfographicInspiration: What Do Robots Think? #InfographicInspiration: What Do Robots Think? published on 04/12/2018 Read more posts by the author of #InfographicInspiration: What Do Robots Think?, tengrrl15 Comments on #InfographicInspiration: What Do Robots Think? One of the sad truths about the job search is that sometimes you get rejected by someone who does not more than glance at your resume. Worse yet, you can get rejected without a human ever looking at your resume. Today’s infographic from hireright.com invites you to “Meet the Robots Reading Your Résumé” and provides some details on how to prepare your job application materials so that the robots like them. Applicant Tracking Systems and Your Resume from Menlo Partners Staffing. #WednesdayWrite: What’s Your Advice for Job Searchers? #WednesdayWrite: What’s Your Advice for Job Searchers? published on 04/11/2018 Read more posts by the author of #WednesdayWrite: What’s Your Advice for Job Searchers?, tengrrl15 Comments on #WednesdayWrite: What’s Your Advice for Job Searchers? This week’s #WednesdayWrite is simple. You have applied for various things up to this point in your college career—jobs, internships, clubs, special organizations, colleges, and so forth. Think about your successful applications (or your unsuccessful efforts) and share a unique piece of advice that you have gained from your experience. Read through the comments left by others to ensure that your advice adds something new to the conversation. You can also add to someone else’s comments if you have a related tip or disagree. 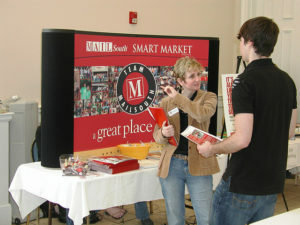 Image credit: Career Fair by Carmichael Library on Flickr, used under a CC-BY 2.0 license. You can find a treasure trove of tutorial videos that will help you apply for a job or internship on the Lynda.com site. You will find courses on LinkedIn, on improving your resume, and on conducting a job search. I’ve created a Lynda.com playlist of Job Application Resources, from which you can choose a course or video that will help you with your job application process. Overall, there are 12 courses, consisting of 287 videos. You would need 16h 37m to watch them all. Of course, I don’t expect you to do that. Instead pick and choose whatever will help you. One of the videos I like focuses on Tips for college grads and early career (3m23s), which discusses issues such as what to do if you do not have any work experience and how to use formatting to pad out your resume without padding too much. There may be times in your work that you will use video to share a progress report. For example, you might record a walk-through of a space you are building to show your stakeholders the progress you have made. A game developer might demonstrate the latest features in a game as progress report on the next version. 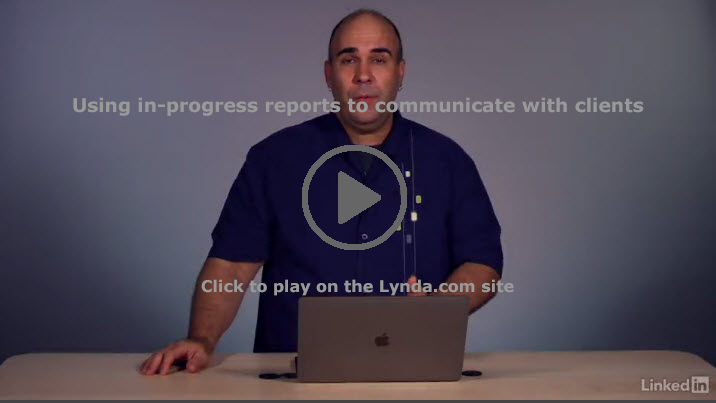 In any career field, you might make a video of a slideshow-based progress report with audio commentary so that stakeholders can watch the show on their own time. Today, I have a video progress report on Charlie, a service dog in training to work with a U.S. veteran who has a disability. The Today Show is working with America’s VetDogs to follow the work that goes into preparing a service dog and highlight how the animals help veterans. This Today Show video is a very informal progress report. It would not work for every audience; but it does demonstrate Charlie’s progress. Listen for details on what Charlie has learned and what will happen in the future as he continues his training. At some point, you are going to face a challenge that threatens your progress on a project in the workplace. No matter how hard you work, it’s bound to happen. Sometimes it’s your fault. Sometimes someone else is to blame. Regardless of who is responsible, the important question is how you will respond. You have to decide what you can do that will preserve your (and/or the company’s) reputation while still satisfying the needs and requirements of your client. That is where today’s #FridayFact comes in: The best strategy is to let people know of problems immediately. I don’t mean call the stakeholders in a panic, of course. Meet with your team or your manager, and figure out how to handle the situation. As soon as you have a plan, let your stakeholders know. Tell them what happened, why it happened (if pertinent), and what you are going to do. Don’t blame anyone. That doesn’t help. Focus on how you will do your best to get the project in as close to the deadline as possible. Sometimes you need your stakeholders to help with the solution. Perhaps they will need to approve a new supply or a different design. In those cases, you meet with your team to figure out the alternatives and their strengths and weaknesses. Once you have the options figured out, contact the stakeholders with the information, giving them a recommendation for the best choice. In addition to my suggestions, check out The Muse’s suggestions for What to Do When You Know You’re Going to Miss a Deadline. P.S. Anyone other than me bugged by the gender representation in that infographic? Notice that it’s all men, except for the suggestion that deals with cleaning. Grr. Note: This infographic has a transcript. Since you are writing your progress reports this week, today’s #InfographicInspiration is the Amyotrophic Lateral Sclerosis (ALS) Association’s Progress by the Bucketful, which shows the impact of the Ice Bucket Challenge. This visual presentation of the progress in the work to find a cure to ALS shows the same kinds of information typically included in a progress report: what has happened, what still needs to be done (and why), and how remaining work will happen (in their section, Why Stop Now?). How effective does this progress report seem to you? Does it accomplish its secondary goal of inspiring people to continue contributing to the fight against ALS? You may also consider what you might include and how you would present information if your progress report were an infographic. Yesterday’s post on visual representation has related ideas that can help you think about how you would create an infographic.